This week, Greenpeace Canada started an unprecedented journey on the shores of Vancouver. 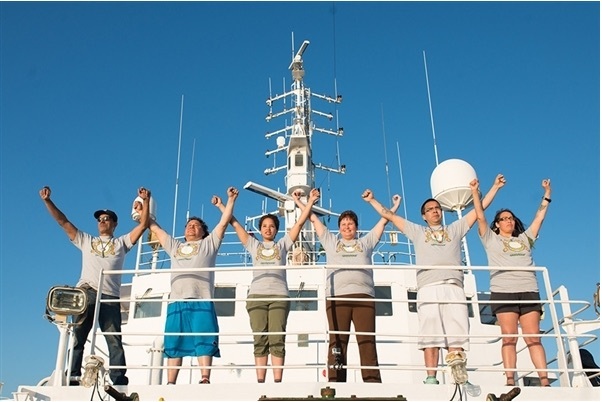 Six representatives of the Canadian First Nation are sailing the first time ever together onboard the Greenpeace ship MY Esperanza. It is remarkable as their goal is to support and connect coastal communities opposing pipelines and super tankers to the seven-million-strong global movement against Arctic oil drilling. Taylor George-Hollis from the Squamish Nation, Candace Campo from the Shíshálh Nation, Audrey Siegl from the Musqueam Nation, Victor Thompson from the Haida Nation, Robert Holler from the Anishinabe Nation and videographer Mike Auger from the Woodland Cree Nation in Alberta follow the Greenpeace call „It’s time to say yes to people, not to oil„. Oil spills, leaking supertankers and environmental destruction are not forgotten – neither the climate change that accelerates the melt of the Arctic. According to the Vancouver Observer: Shell Oil is investing billions of dollars in the Arctic, and says the polar region contains 13 per cent of the world’s undiscovered oil, and 40 per cent of its yet-to-be-found natural gas. In Alaska, Shell proposes to drill into a sea bed 42 metres below the waves at a drill site 112 kilometres from the village of Wainwright, using its drill ship, Noble Discoverer, and submersible Transocean Polar Pioneer. “Every single person on this planet is powerful and when we each understand and embrace our inherent power, we can change anything. What happens to the planet happens to each of us. So, let’s join hands with every single human to change things now,” says Victor Thompson from the Haida Nation on Canadian greenpeace.org. As activists and ordinary people have been protesting Arctic drilling all around the world the movement is growing everyday, incorporating new voices as those of the First Nation representatives. For a good reason: Most severely affected and threatened by oil developments are the coastal First Nations of British Columbia. That’s why this summer the West Coast is having a leading voice in the global opposition to Big Oil. For ten days, Greenpeace will sail the Esperanza to B.C. coastal communities such as Haida Gwaii to inform about the increased oil spill risks to the province’s coastline and to oppose Arctic oil tankers.